When you buy a car (or really any other kind of motor vehicle), you want to be assured that the manufacturer of said car or motor vehicle provides a certain level of quality on a consistent basis. From the field of safety to the push for innovation, it’s important to many prospective car buyers the dedication that manufacturers put into their vehicles. At a Chevy dealership, there is nothing but dedication and a staunch commitment to excellence. A Chevy dealership is a place where all kinds of car owners – from the mom of four to the car enthusiast (or the mom of four who is a car enthusiast) – can find the right motor vehicle for them, one that will be nothing less than a joy to drive for years to come. Below, is a short list of reasons to choose a Chevy, but this list is by no means exhaustive. The prospective car owner should thoroughly conduct research, compile lists of potential cars of interest, and, of course, visit a Chevy dealership. If you’re looking for what sets the Chevy brand apart from other car and motor vehicle manufacturers, look no further. Though it can be argued that many various car manufacturers are looking to push the envelope and go where the auto industry has not gone before, it can also be argued that the Chevrolet brand works to take it the farthest. Take, for instance, their line of electric cars which are able to easily be found at many a Chevy dealership. Chevrolet currently has two electric cars available, the 2018 Volt and the 2018 Bolt EV. Let’s start with the 2018 Volt. First of all, it’s important to note that, for an electric car, it’s reasonably priced, with a starting price at just over $30,000 (of course, the addition of premium features will increase this price, but that will change from buyer to buyer and depend on their individual needs as drivers). The 2018 Volt will be able to rely only on an electric charge for as many as 53 miles, and for longer trips, a full charge in addition to a full tank of gas will get the Volt further than 400 miles, an astonishing feat for any car, electric or otherwise. This means that, even with an initial price that could be considered high, the car more than makes up for it through the conservation of gas. The Bolt EV takes this even further and eliminates the need for any gas tank at all. In fact, the Bolt EV is touted as the first completely electric car made accessible and available to the general public. Though the Bolt EV has a starting price just over $35,000, it too more than makes up for its high initial cost with superior mileage, going more than 200 miles off a single electric charging session, eliminating the need to buy gas entirely. For every hour that you charge it, you get twenty-five miles of driving time. And not only do these electric cars save money – they lessen the environmental footprint that you leave by a considerable margin, making eco friendly practices as easy (and stylish) as possible. 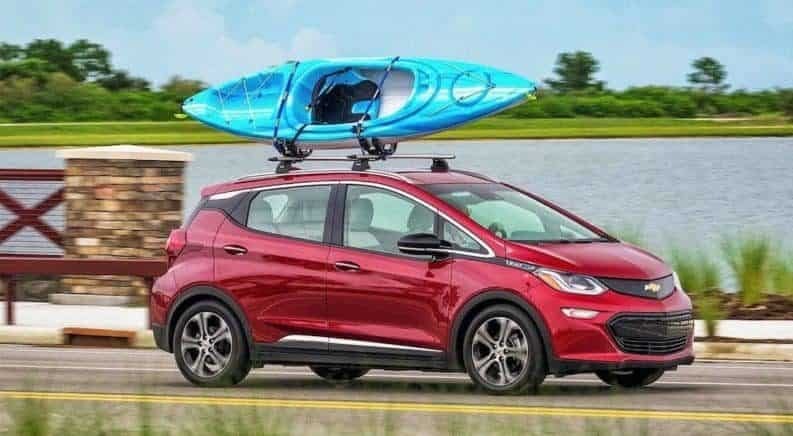 Becoming eco friendly doesn’t mean sacrificing, as the Chevrolet electric cars show clearly, and can even add to the overall quality of your life. For those who have thoroughly perused a Chevy dealership and have found the car of their dreams, it is now time to look in to optional extras. Though optional extras like accessories and premium features will often raise the overall price that you pay, it is important to note that these features can add a lot to your driving experience, such as additional comfort as well as improved safety while on the road. A Chevy dealership can also provide features that simply just make driving and maintaining your car more enjoyable. For instance, one popular feature offered by Chevrolet is the durable weather mats for the floors of your car. These weather mats are particularly ideal for those living in climates with many kinds of weather such as snow, rain, and all that comes along with it (slush, mud, etc.). The simple addition of weather mats can keep your car feeling like new, as they are easy to remove and clean (much easier than trying to clean the actual floor of your car). Chevrolet has also made a stride towards full accessibility with their assist steps, often offered for trucks or other larger motor vehicles (such as an SUV, for instance). These assist steps come in a number of styles and color options and can be utilized for a number of purposes, from letting small children independently get in the car to helping those with minor to moderate mobility issues do so as well. Buying a car is often an expensive ordeal, the thought of which leaves many people hesitant to buy a car in the first place. But at a Chevy dealership, the salespeople will work with you to create a payment plan that you are fully comfortable with. For one, it is possible to open a credit line through your nearest Chevy dealership at the time of payment, making it easier to finance your car directly. You can also often set up a payment plan, something that the majority of car buyers will do when purchasing their new (or used) Chevrolet motor vehicle. There are many ways to get the car of your dreams, and it helps that the majority of Chevys are moderately priced in a way that has been referred to as a fair market price. Looking for your ideal Chevy is an exciting time for anyone, no matter what kind of Chevy they end up purchasing. Your nearest Chevy dealership will be able to help answer any questions that you may have, from premium features to payment plans.